According to the World Health Organization report1, breast cancer is the most prevalent cancer in women worldwide and its incidence is significantly increasing, particularly in developing countries where the majority of cases are diagnosed in the later stages of cancer. Survivors of breast cancer have a higher chance of developing both type 1 and type 2 diabetes, specifically in the post-menopausal stage of life.2 Conversely, female individuals with diabetes have a 20% greater chance of developing post-menopausal breast cancer than those without.2,3 The breast cancer incidence is rising in South Africa, where some women are diagnosed late and, as a result, have poor outcomes.3 The association of type 2 diabetes mellitus and breast cancer among African women has already been established.4 Therefore, the relationship between insulin and breast cancer cell progression and migration should be further explored. The current global market for cannabis products is USD3 billion; this figure is expected to rise to USD56 billion within 10 years, as more countries and US states join the legalisation trend.10 South Africa is one of the world's largest producers and exporters of quality cannabis, and is the main regional hub for cannabis cultivation and trading. All African nations are capable of cultivating medicinal marijuana - of the 'hemp' and 'dagga' variety - to exploit the growing international acceptance of cannabis-based medicines.11 However, there is an apparent misidentification and confusion regarding the quality of 'hemp' and 'dagga', as C. sativa is known in southern Africa. Here we summarise the regulatory role of insulin in MAO-A and IL-6/IL-6R-regulated metastasis and angiogenesis in breast cancer in patients with diabetes and the possible importance of the South African variety of C. sativa is outlined as a possible beneficial research option in this context. The pharmacological efficiencies of C. sativa in inhibiting breast cancer cell progression and migration will support the medicinal application and will act as an initial step towards its industrialisation, thereby contributing to the South African bio-economy through its R&D. Targeting the tumour vasculature, rather than directly targeting tumour cells, has been the more recent approach to inhibiting tumour growth in all invasive and metastatic cancers, including breast cancer.12 The growth of breast cancer cells is under the direct regulation of hormones, growth factors, chemokines and their receptors.13 Both hyperinsulinemia and cancer are extremely prevalent pathophysiological conditions associated with major morbidity and mortality worldwide. The implication of insulin in the pathogenesis of cancer has been in English medical literature since the early 1970s14; however, the possible molecular mechanisms of insulin's effect on cancer development and/or progression remain enigmatic. Other findings demonstrate that regulation of monoamine levels by MAO activity in β cells is pivotal for physiological insulin in type 2 diabetes.21 In contrast, MAO inhibitors are capable of both potentiating and inhibiting insulin release in vitro, depending on their concentrations. It is further concluded that the stimulation of glucose-mediated insulin secretion may be related to the MAO inhibitory effects of the drugs.21 MAO inhibition has also been reported in a patient with type 1 diabetes and depression.22 Reduced MAO activity in blood from insulin-dependent subjects with diabetes increased the possibility of tumour cell progression and invasion in breast cancer. Although hypoxia is a common clinical condition in the tumour environment in which it promotes cell invasion, metastasis and angiogenesis, it inhibits insulin-signalling pathways.21,23 Therefore, the regulatory role of insulin in breast cancer cell progression in persons with and those without diabetes needs to be delineated; development of the possible therapy outlined here will provide new insight into the immunotherapy of breast cancer. Importance of South African Cannabis sativa L.
Cannabinoids could be the first non-toxic agent to show promise in treating metastatic forms of breast cancer.26 CBD inhibits the survival of both oestrogen-receptor-positive and oestrogen-receptor-negative breast cancer cell lines and induces apoptosis in a concentration-dependent manner.26,27 Many cannabinoids mediate their effects by binding to endocannabinoid receptors like CB1, CB2 or the vanilloid receptor; however, it is indicated that the effect of CBDs is independent of these receptors.26 Therefore, scientists are always trying to identify the receptor(s) through which CBD mediates its anticancer effects. The recently established immune biological aspect of IL-6R-regulated and MAO-A-mediated breast cancer cell progression and migration will be the immediate future target of investigations into the effect of cannabis in this context. Breast cancer cell progression and migration is directly influenced by insulin levels in patients with diabetes and IL-6/IL-6R mediates its regulatory role in MAO-A-controlled cell metastasis and angiogenesis. Importantly, the IKS Research Group of the Department of Pharmacology at the University of the Free State (Bloemfontein, South Africa) is presently working on this immunobiology and validating this dual role of cannabis in the South African context. 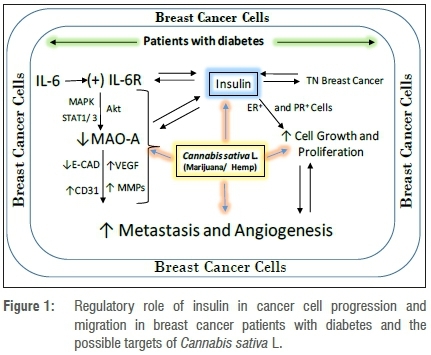 The CBD-enriched variety of C. sativa found in South Africa may offer new hope for the regulation of insulin action on MAO-A- and IL-6/IL6R-regulated metastasis and angiogenesis in breast cancer of patients with diabetes, as shown in Figure 1. The pharmacological efficiencies of C. sativa in inhibiting breast cancer cell progression and migration will further support its medicinal application and will lead to further industrialisation, thereby contributing to the South African bio-economy in the future.